Last night the Dodgers defeated the Diamondbacks, 7-4, to drop their magic number to five games, with just five games to go. "I really like the at-bat quality, and he's gotten big hits for us, but tonight was probably the biggest, the home run that tied the game up," said Roberts. "He's a leader, doing things the right way, and guys tend to follow him. When we're talking about approach and having a plan as a team, he's all in. He's all that we had hoped for." 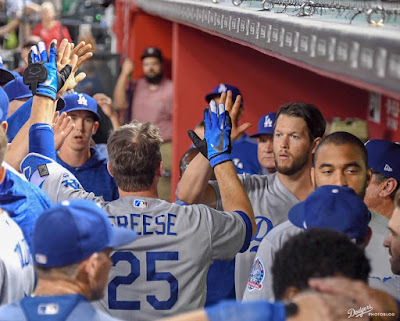 "You understand what this organization is trying to do and you get called upon to help out," said Freese, part of the club's right-handed-hitting platoon. "You do whatever Dave asks of you. You need to be productive and help the team, and so far, I think I've done a decent job of doing my thing and filling my role. This never gets easy, but we're all professional hitters and we're handling it pretty well." This Day in Dodgers History: In 1941 the Dodgers won their first NL pennant in 21 years when they defeated the Braves in Boston, 6-0. In 1956 Dodgers hurler Sal "The Barber" Maglie no-hit the Phillies at Ebbets Field, 5-0. At 39 years old he became the oldest pitcher to throw one. You can listen to the last inning of Maglie's no-no (as called by Jerry Doggett with Vin Scully) here. In 1974 Dr. Frank Jobe performs the first ulnar collateral ligament reconstruction surgery on Dodgers pitcher Tommy John's left elbow. The revolutionary procedure would soon be known as Tommy John Surgery.